Our network of websites provides brides with the confidence that they are selecting only the best. Ask us about our websites and get yourself listed today. Targeted exclusively for the upscale bride, Elegant Wedding magazine reaches a stylish and well-to-do audience. Our readers seek the utmost in opulence, service, and amenities. The Elegant Wedding Showcase is Montreal’s luxury bridal show. This one day event gathers the cities finest under one roof. Are you looking to promote your services to a high end bride? The Elegant Wedding brand is about quality and everything pretty. Magazine, Website and Bridal show, we have everything available for you to grow your business. has been inspiring and Quebec and Ontario brides-to-be with a fresh mix of beautifully photographed style shoots and real weddings. In addition to showcasing the diverse weddings of local couples across Canada, each issue showcases ideas on essential topics ranging from fashion trends and wedding themes and planning. Reach our highly engaged readership in our print and digital magazine. Because weddings are so unique, how you market your wedding products and services requires a very detailed approach. Elegant Wedding can help you leverage your website and marketing channels to maximize your success online. Join our group of websites and be found online. The Elegant Wedding Bridal Showcase is Montreal’s boutique bridal show. 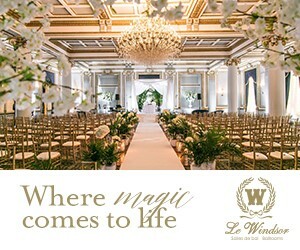 Immerse yourself in the world of luxury weddings, showcase your services in Montreal’s newest and hottest venue “Quai Alexandra”. This beautiful venue will be transformed from top to bottom. We are proud to say that we have raised the standard of wedding shows. Brides will spend a day planning their wedding with Montreal’s leading bridal retailers. A newly engaged bride will come to us right at the start of her planning. She is looking for help and advice and a guiding hand through the exciting journey of planning her wedding. We are strong believers in publishing content from our advertisers. This gives your brand a chance to appear in front of a highly targeted audience. We target the upscale bride, Elegant Wedding magazine reaches a stylish and well-to-do audience. Our readers seek the utmost in opulence, service, and amenities. The Elegant Wedding Showcase is Montreal’s luxury bridal show. The one day event gathers the cities finest under one roof. Are you looking to promote your services to a high end bride?